The aggressive all-terrain design is engineered to provide outstanding performance in both on-road and off-road driving applications. 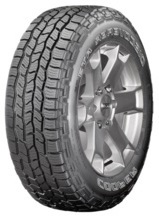 The A/T3 tread pattern exploits a combination of features specifically suited to provide solid all-terrain performance, superior all-season traction, excellent stability, confident handling and reliable tread wear. The tread compound is formulated with a chemically coupled silica and carbon black mixture that provides excellent wet traction and handling on the highway, while also improving cut and chip resistance in more harsh rocky and gravel terrain. The silica enriched tread compound has lower rolling resistance than traditional full carbon black tread compounds. The dual draft angles on the tread element walls aid in reducing stone retention, stone drilling and assist in cut and chip resistance. Serrated steps in the lateral grooves of the intermediate tread rib reduces the chance of stone retention and stone drilling.